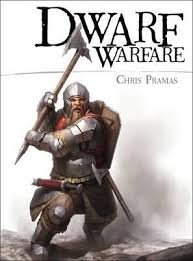 Dwarf Warfare - ubiq bookshop: the best place to buy books! Despite their short stature, Dwarves are amongst the toughest fighters of all the races. Thanks to their great strength and stamina, Dwarves march to battle in thick armor and carrying numerous heavy weapons. This book compiles all of the information known about these grim warriors and how they practice war. From an initial examination of the fighting methods of the individual Dwarf soldier, it expands to look at how they do battle in small companies and vast armies. It covers all of their troop types from their axe men that form the front lines of battle to their deadly accurate crossbowmen, and noting their specialist troops such as their famous siege-engineers. Also examined are their tactics in specific situations such as underground fighting and fighting in mountainous terrain. Finally, the book examines a few specific battles in great detail in order to fully demonstrate the Dwarven way of war.